At Mid-West Metal Products we provide precision CNC wire coil forming of fan and other wire guards. We have built a dedicated Wire Fan Fabrication Cell to service our multitudes of fan guard customers. 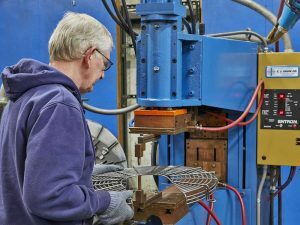 Our CNC wire coil forming equipment is able to work with wires ranging from 11 gage to .25″ in diameter. We are equipped with automated wire mesh welding equipment that can produce mesh sizes to .5″ center-to-center wire spacing, all to a tolerance of ±.039″/1mm, in sizes up to 5′ x 10′. A wide variety of fan guard and wire guard types are available: two- or three-dimensional, continuous or individual coils. HVAC and OEM customers have requested everything from belt guards to sheet metal enclosures with louvers. We can fabricate guards in many shapes, and offer attachment methods ranging from stiffeners to hooks to eye bends, and can provide powder coating, plating, or many other finishes. For more information about our custom fan guard and wire guard fabrication capabilities, or our other products and services, please contact Mid-West Metal Products Co., Inc.